Restraint's not an option when it comes to Dallas. So take it from TNT's publicity department, the Wednesday, August 8th Season 1 cliffhanger "will leave everyone shocked and on the edge of their seats." I've seen it, and it's not bad. Nothing like the time J.R. Ewing sustained a gut-full of bullets from a would-be assassin. But not bad, even if your jaw doesn't drop enough to win Olympic gold. As with last week's penultimate episode, the first-year's closer will go against NBC's Summer Games coverage from 8 to 9 p.m. (central) after the preceding nine episodes air in sequential order beginning at 11 a.m. on TNT. That's tough competition even for Larry Hagman's many-splendored eyebrows, the best in the business since Andy Rooney's death. Last Wednesday's Dallas drew 3.24 million viewers nationally opposite the Olympics, good enough to rank it as cable's No. 1 original series for the night. But the Ewings' double-pronged June 13th premiere averaged 6.86 million viewers for the back-to-back episodes. If that's a gusher, then current ratings for Dallas' highly publicized return engagement are the equivalent of mineral deposits. 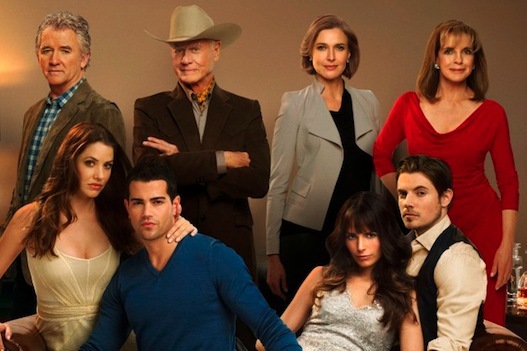 TNT isn't complaining, though, renewing Dallas for a 15-episode Season 2 way back on June 29th. All in all, it's been a high, wide and handsome production, with old hands Larry Hagman, Linda Gray and Patrick Duffy sharing decent-sized chunks of screen time with the new version's younger recruits, most of them former regulars on Desperate Housewives. What might have been a fiasco has turned into a solidly entertaining romp through multiple back-stabbings, bed-hoppings, Bobby Ewing's cancer scares and two fatalities after the opening seconds of Wednesday's season finale reveal who emerged from last week's lethal tussle between Christopher Ewing's estranged, duplicitous pregnant wife, Rebecca and her rotten "brother," Tommy. We'll throw in one more tidbit about Wednesday's cliffhanger. Ken Kercheval's Cliff Barnes again is listed as a guest star, and his eventual appearance re-greases a lot of moving parts for next season. Postscript: The Season 1 finale, in which Christopher Ewing's estranged wife, Rebecca, was revealed to be Cliff Barnes' daughter, drew 4.29 million viewers nationally to rank at the top of all that night's cable programming.